You’re a writer! Congratulations on pursuing your dream! I’m also a writer. I realized from my experience and from the experience of my writer friends that the number one question you ask yourself after you start living the dream is this—What do I do about the money? ♦ You’ve just gotten started and aren’t making a lot of money yet. ♦ You’ve been writing and are making some money. ♦ You’ve been writing and are making more money than you can even believe! No matter which of these categories you are in, THE BUSINESS OF WRITING will help answer that question. Most writers are imaginative people living vicariously in the wonderful worlds they create. Words are their tools and their joy. Numbers are another story. The idea of balancing a checkbook, filing taxes or anything financial besides cashing royalty checks is something they either love (not often), HATE, or just don’t really get or care about. THE BUSINESS OF WRITING will make managing the financial side of your career as straight-forward as writing “The End” on your latest creation. The Business of Writing is a no-nonsense approach to handling the money side of being a writer, whether you’re a novice or someone who’s been in the business for a while. It offers great resources for keeping your writing finances organized while also introducing basic financial concepts that every author needs to be aware of. Simple. Straight forward. I can’t recommend it enough. — Dee Carney, award-winning, best-selling romance author of KEEPING PACE. You need to know what’s happening with your money. If you find you are perfectly capable of doing the work yourself, but you just don’t want to, THE BUSINESS OF WRITING will show you what you’ll absolutely have to know when trusting someone else with your money. There are too many horror stories about people entrusting their finances to an “expert” only to find themselves mismanaged, robbed or flat broke. You don’t want to be that writer, and I don’t want you to be that writer. What expenses are specific to writers–when they are deductible and when they aren’t. What receipts you need and how long to hold onto them. What financial rules pertain specifically to writers. What the Hobby Loss Rule is and why you need to know about it. How you can get all of your financial paperwork organized once and for all. How to turn bill paying into a once-a-month, practically painless process. How you should be organized—-Sole Proprietor, General Partnership, C corporation, LLC, Subchapter S Corporation–and why. BONUS! Along with your purchase of THE BUSINESS OF WRITING, you’ll receive links and references to important financial and tax information essential for running your business as well as FREE DOWNLOADABLE FORMS to use in preparing your Money Journal–the key to your financial success. 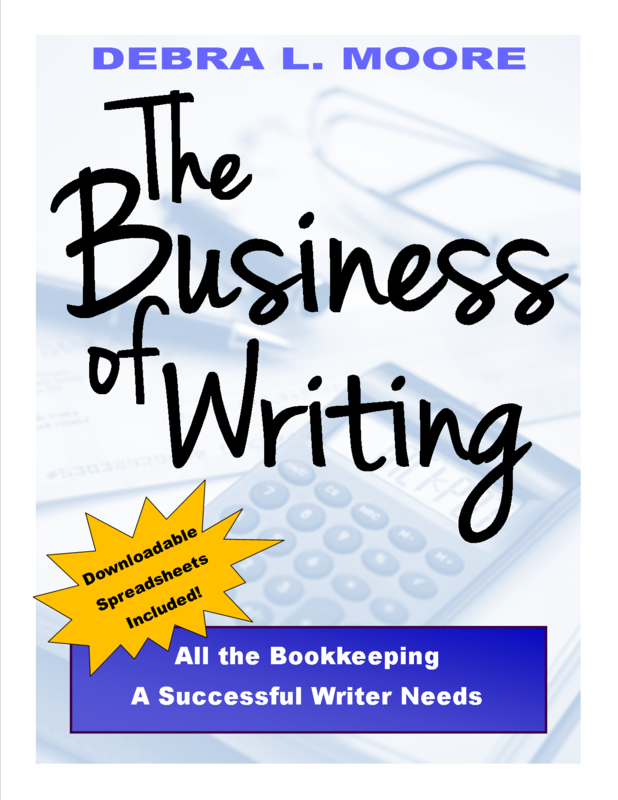 THE BUSINESS OF WRITING is available NOW, and you can get a electronic copy today for the introductory price of $3.99.